When the tomatoes start coming from the garden they can just overwhelm you. You can only eat so many fresh tomatoes, and then you have to start figuring out how to store them. Of course you can always can tomatoes, and we do a lot of that. Stewed tomatoes, salsa, stewed tomatoes with jalapenos, and canned spaghetti sauce all find their way into our pantry. But still, we have tomatoes. A lot of tomatoes can be stored in a small space by drying them. I have a small counter-top, electric dehydrator that my daughter and son-in-law gave me three years ago, and it is really convenient for drying tomatoes and other vegetables and meats. My dehydrator is made by NESCO, and I have been very happy with it. This little dehydrator only takes up about a square foot of counter top, but because of its stacking-tray design it will hold from 15 to 20 medium sized fresh tomatoes at one time, and it will dry them in a day. 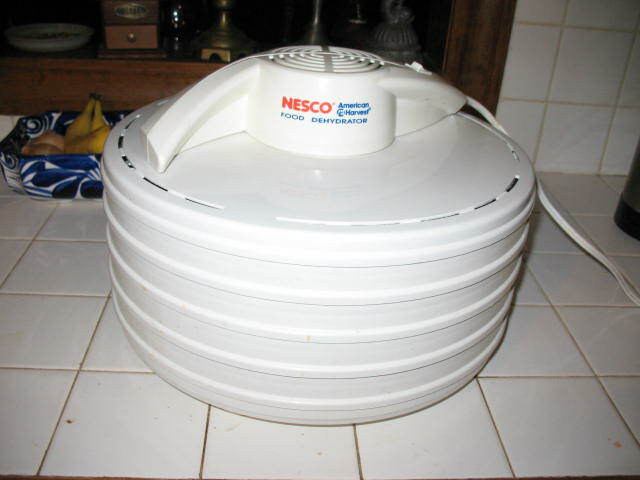 Pictured below: NESCO food dehydrator. Drying tomatoes couldn’t be easier. You just slice the tomatoes about a quarter inch thick and lay the slices out on the trays. Try not to let the slices touch each other so that you can get maximum air circulation. Stack the trays, turn the dehydrator on, and check it periodically to determine when the tomatoes are dried just right. You want to drive enough moisture out of the tomatoes so that they won’t spoil, but you don’t want them to be so dry that they are brittle. They should be about the consistency of dried fruit leather. Dried tomatoes will not re-hydrate to the point that they are like fresh tomatoes; but they will work great in soups, on pizza, in casseroles, or just to munch on. 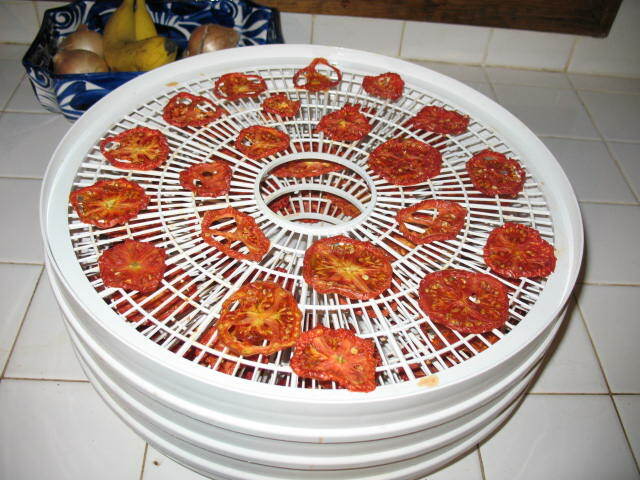 Pictured below: Dried tomatoes on dehydrator tray. 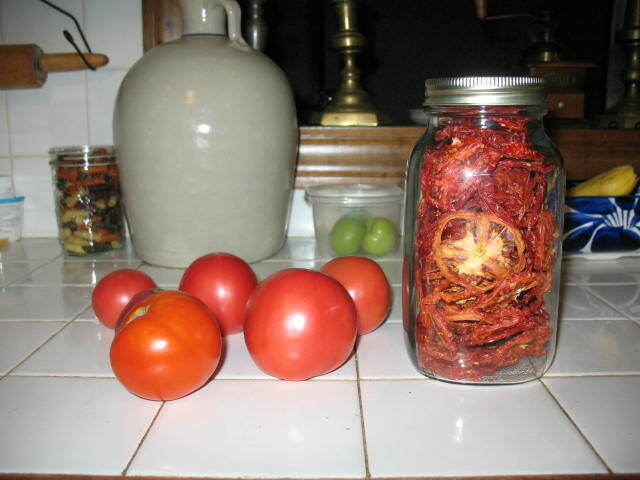 When my tomatoes are dry, I seal them in clean canning jars and store in the pantry. They will keep all winter long. Pictured below: Fresh Arkansas Traveler tomatoes and a one quart canning jar with 16 dried tomatoes in it.